It’s not always easy to understand how Stirling engines work. I’ll try and explain here the best I can. A fixed amount of gas is sealed inside an engine. The gas is then moved back and forth from the hot side to the cold side of the engine. When the gas is on the hot side, it is heated and expands. When it’s on the cold side, it cools and contracts. Stirling engines have regenerators. A regenerator is a heat exchanger inside the engine that saves some heat from one cycle for use in the next cycle. There are no valves in a Stirling engine and there is no intake or exhaust (from the engine itself) because the working gas is sealed inside the engine. The article below will explain in detail, many different things about Stirling engines. When a typical gasoline or diesel engine completes its cycle, it opens exhaust valves and dumps exhaust first into an exhaust pipe and then quickly into the environment. Stirling engines don’t have an exhaust (from inside the engine) because the working gas is used again and again in every cycle. 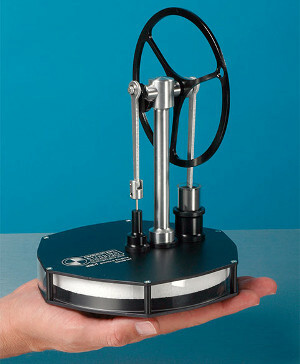 Of course, Stirling engines can be heated by flame heaters (or any other form of heat). If the Stirling engine is designed to use flames to heat the hot side, the heater will certainly have an exhaust. Flames make most of their smoke when the are starting and stopping. Since the flame on the hot side of a Stirling engine is continuous, these flames can be very clean burning. Think of when a burning match makes the most smoke. It makes the most smoke when you light it and when you blow it out — right? 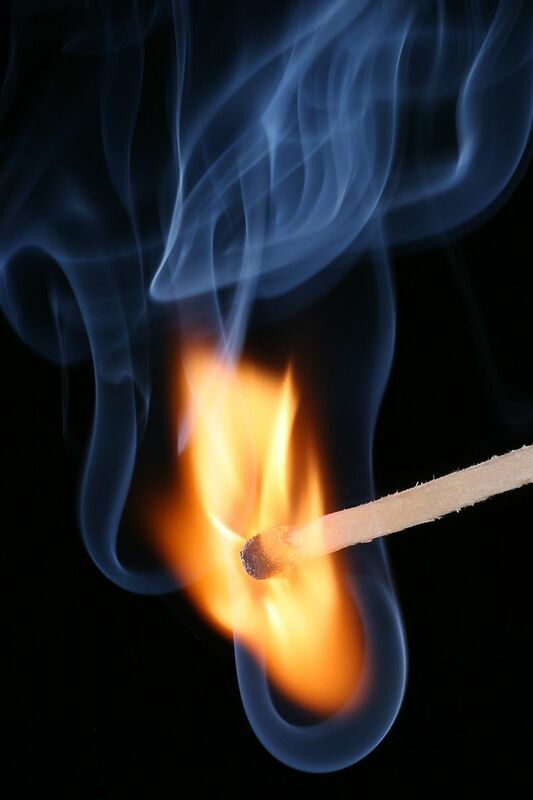 Matches can burn with very little pollution in the middle of their burn cycle. The same is true for any flame. Flames make most of their pollution when they are starting and stopping. Since gasoline and diesel engines are continuously starting and stopping their flames, it is more difficult to make them be clean running engines. Stirling engines are able to capture and re-use some of the heat that would otherwise be wasted by using an internal heat exchanger called a regenerator. A regenerator is anything inside the Stirling engine, usually a specifically designed part, that allows heat to be stored from one cycle and used again in the next cycle. Regenerators are often made of foil sheets, stainless steel wool, or a metallic sponge. In low-temperature difference engines, they’re often made of plastic foams, sponges, and air filtering materials. 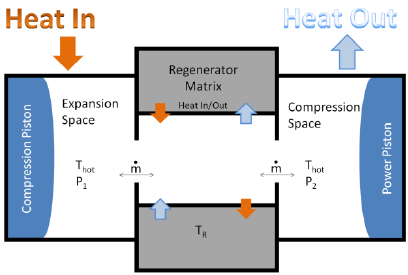 A regenerator reduces the amount of wasted heat, by storing heat from one cylce for use in the next cycle. When the working gas flows over the regenerator on its way from the hot side to the cold side of the engine, it stores some heat in the regenerator. Then when the air flows back from the cold side to the hot side, it picks up some heat from the regenerator. This means that the engine will use less fuel or (or solar energy) for a given amount of efficiency and for a given power output. Regenerators are one of those almost too good to be true things in the world of engineering, but they are true. There really is no such thing as a free lunch in engineering, but well-designed regenerators in well-designed engines can dramatically improve the performance of a Stirling engine. See my complete article on Stirling engine regenerators here. A Stirling engine running on ice. One of the fascinating things about Stirling engines is when you watch low-temperature difference Stirling engines that appear to be running on ice cubes. How could something possibly be fueled by cold? Well, in fact, the fuel source is not the ice. The fuel source is the heat from the room and, if the room’s temperature were to fall to the temperature of the ice, the engine wouldn’t run. These engines are a lot of fun and of course you can use any frozen desert as a “fuel source” with the added benefit of getting to eat the fuel. Our MM-7 Stirling engine, powered by the heat of my hand. Another remarkable demonstration of Stirling engines are heat of your hand Stirling engines that will run on the temperature difference between the heat of your warm hand and the room temperature air. Note that if the room temperature air gets to be the same temperature as your hand, these engines won’t run either. If you like this kind of thing, check out our Heat of Your Hand engine here. Stirling engines can be made to run on very tiny temperature differences. But, as the temperature difference gets smaller, the size of the engine required to put out a significant amount of power is larger. A Stirling cryocooler made by Janis. It’s not immediately obvious, but a Stirling engine is a reversible heat pump. If you put a heat source on one side and a cold sink on the other side, you will get mechanical power out of the shaft. What isn’t obvious, is that if you use an electric motor to put mechanical power into the shaft, one side will get hot and the other side will get cold. This applies to all Stirling engines, even low-temperature difference Stirling engines. Engines that are designed to run on tiny temperature differences will only produce tiny temperature differences. 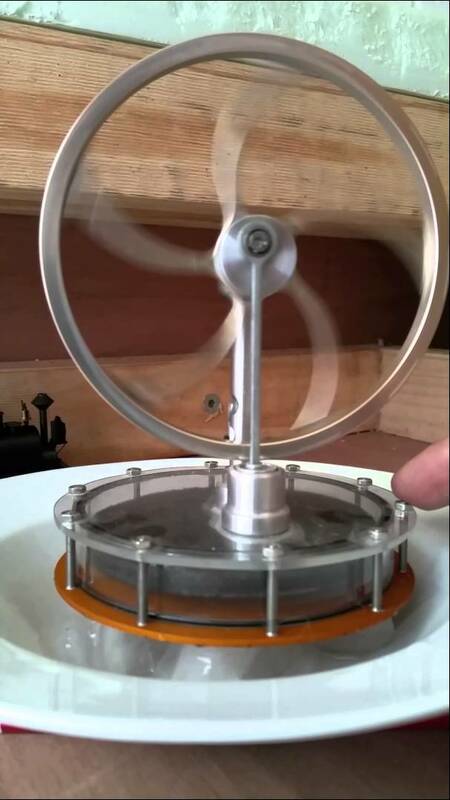 Unless you do an amazingly good job of insulating a low-temperature difference Stirling engine, you’ll never be able to detect a temperature difference that would be produced if you were to motor the engine. If you buy any Stirling engine that is designed to run on a flame, and turn the output shaft with an electric motor, you will notice that one side gets hot and the other side gets cold. It’s best to try this with an engine has that feels like it has some “bounce” on the compression stroke as you turn over it in your hands. Motoring means putting an electric motor in the output shaft and turning the engine. Just hook up an electric motor to the output shaft and run the engine at the same speed that you would expect it to run at if you were operating it as an engine and not a refrigerator. Almost any gas can be used as the working fluid inside of the Stirling engine, but there are only a few gasses that make sense. The lighter the gas, the better it does its job of transferring heat inside the engine. Hydrogen would be the optimum gas. Helium, however, would also be a good option. Helium and hydrogen are famous among Stirling engine engineers for being difficult to keep from leaking out of Stirling engines. These tiny gasses tend to find their way out of even carefully designed engines. Hydrogen can migrate right through many different metals. These gasses well only in engines like free piston engines that don’t use a spinning mechanical output shaft and can be completely sealed. Some recent designers of Stirling engines, notably Don Clucas the designer of the Whispergen Stirling engine from New Zealand, have used nitrogen as a working gas. Don says that nitrogen can be made to be an excellent working gas and it’s much easier to keep sealed inside the engine for long periods of time. When Phillips Electronics revived the modern Stirling engine in the 1950s, engineers noticed right away that they could get more power out of the given size engine by pressurizing it. Since their first engines used air as a working fluid, it was fairly simple to build an engine that would pump itself up and put out more power as it increased in pressure. These engines would start as atmospheric pressure engines and then pump up the working pressure to produce the desired power output. The problem with this was that they were accidentally building a bomb. Yesterday, today, and forever, the components of the fire triangle are and always will be oxygen, heat, and fuel. When you pressurize the oxygen, the fuel, and the lubricants inside the engine, it’s easy to see why several air pressurized Stirling engines have exploded in the past. This resulted in at least one fatality at Phillips. Stirling engines do need to be pressurized to produce reasonable power outputs with smaller sized engines. However, air should never be used as a working gas if there’s any possibility that petroleum lubricants used in the engine might possibly explode. Pressurized air engines could be safe if they are totally dry engines inside with no lubricants that might vaporize and possibly explode.